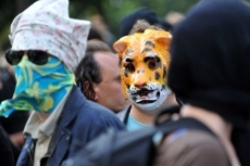 The European wide network „out of control“ was created in 2009 with the purpose of a cross-border collaboration of activists against a European security architecture. We are comprised of a wide range of activists throughout Europe, that all have in common their will to bring out a clearer overview of the European security and control architecture. We are certain that we can move on from understanding and analysing, towards structuring and organising resistance. We focus on police collaboration and databases, policing crowds at large events such as summit protests, the security industry and security research as well as EU-wide treaties which endanger civil liberties all over the world. We notice that there is no European wide response towards the border-crossing repression of the EU while it evolves into a state with its own powers. Struggles are taking place in some EU member states in sub-areas like data retention or of course against the EU migration regime and the Frontex agency. Further on, we also notice the lack of a common understanding of the construction of the security architecture and its European architects. As a first step, we want to exchange experience, knowledge and information to have a clearer collective and common idea of the European security architecture. In a second step we want to establish common and convergent actions and campaigns. We are not suggesting to single out one of the numerous struggles against the European security state as a priority. But we want to ask ourselves collectively how we can struggle together to arrive at effective practices against this new security order. We are not naive. We know that it will take a lot of time of synthesising, understanding and commitment. We are looking at this project as a long term process. We are sure, that the cross-border repression organised on EU-level must be countered by cross-border solidarity and action. After a constituting meeting in summer 2009, we came together in autumn to a broader assembly in Freiburg with participants from a handful of countries in the EU. Our first step was to analyse the means that changed the landscape of European security collaboration. We looked at technical tools such as border control sensors, biometrics, video surveillance, police usage of satellite data, flying cameras, non-lethal weapons, investigation software, “predictive analysis” and databases like the Visum Information System VIS, the Schengen Information System SIS or the fingerprint database EURODAC. Thereupon we reviewed European level actors, such as the European Commission, its agencies Frontex, Europol and the European Gendarmerie Force EUROGENDFOR, and looked at strategies like the „Stockholm Programme“, the Lisbon Treaty, the scheduled „internal security strategy“ and the merging of police, military and intelligence. Further on, we also focused on various European companies that provide this apparatus with ever new technical gadgets. The final session of our meeting had the aim to decide on future networking and action. We did not yet focus on concrete plans, but agreed on a long-term analysis and collaboration in various forms of protest and resistance. The idea of the five year “Freiburg Programme” was born. Decisions on a European level need some time for their national implementation in the 27 member states, we want to be prepared and launch actions as early as possible. One of the the protests we were involved in was during the resistance against the NATO summit in Strasbourg, where we organised the action day against the European security architecture with a „PaRaDe SoLiDaIre CoNtRe Le CiRqUe SeCuRiTaIrE“. Some of us will participate in the No Border Camp in Brussels, which is scheduled for October 2010 during the Belgian EU presidency. We plunged into several working groups dealing with our internal organisation, outreach and actions. We are communicating via a social network for radical activists (see https://we.riseup.net). We have decided to meet again in 2010. The date is yet unclear, keep an eye out. In order not to get too depressed by dealing with cross-border repression, we decided to create a new Blog collecting calls and actions that target European security architectures.